The Canadian Space Agency (CSA) released it’s 2008 State of the Canadian Space Sector report today which was prepared by its Policy and External Relations Directorate. According to the report the Canadian space sector employed 6,742 people in 2008 with increasing revenues to $2.79 billion which is a 17.8% increase over the previous year. Export revenues increased significantly by 41.5% to a record level of $1.40 billion and accounts for 50% of total revenues. Meanwhile, domestic revenues increased very slightly by 0.7% to $1.39 billion and account for 50% of total revenues. Of the four space sector activities surveyed, Satellite Communications reached $2 billion inrevenues followed by Navigation at $254 million, Earth Observation at $200 million and Robotics increased to $110 million with Space Sciences decreasing to $68 million. After a three consecutive years of a decline the Canadian space workforce increased by 4%. Of the space categories surveyed, results indicate growth in all except Space Research. 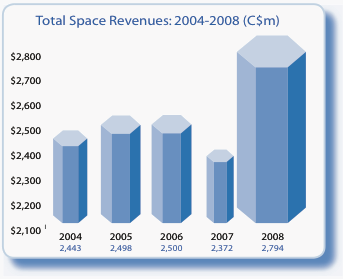 Space Segment revenues increased to $508 million, as well as Ground Segment which reached $335 million. Applications and Services continued to grow, reaching just under $2 billion, and Space Research fell to $24 million. The top ten highest earning space companies have all shown real growth ranging from 12% to 48%. Revenues derived from manufacturing have been growing steadily since 2004, reaching a five-year high in 2008 o f$996 million. Space Research & Development expenditures totalled $56.4 million in 2008, with 60 organizations currently undertaking space R&D projects. Defence related revenues totalled $109 million representing 3.9% of total revenues. Of the $109 million defence related revenues, $85 million represents defence related exports, while$24 million are defence related domestic revenues.